“This has 30 grams of sugar alcohol,” says Corinna Martinez Luna, frowning at a bag of sugar-free Jelly Beans. As part of a lesson on examining deceptive health claims, she continues to read off the nutrition label, her eyebrows inching higher with every ingredient. Martinez Luna, an eighth grader at Terman Middle School, is one of the 60 students whose lives have been changed by DreamCatchers, a twice-weekly after-school program based at Palo Alto High School that is devoted to helping underprivileged middle school students within the Palo Alto Unified School District with academics and life skills. DreamCatchers students participate in a cooking class where they made smoothies and kale chips to teach them about nutrition. “I want to double major in architecture and interior designing,” Martinez Luna says. For Martinez Luna, the fact that her parents never finished grade school isn’t even a speed bump on the road to achieving her aspirations — so far, she’s well on her way, with all As save for in her math class. For eighth grader Giselle Navarro, whose parents never had the opportunity to attend college and whose older siblings graduated from Palo Alto schools but prioritized raising a family over higher education, DreamCatchers promises a brighter future: with their help, she overcame the difficult transition to middle school. In the first few weeks of sixth grade, she couldn’t turn in her homework because it was too hard; now, she consistently turns in work and can explain solutions to the class. Corinna Martinez Luna and her brother collaborate on their math homework. DreamCatchers helped Navarro improve her study habits, gave her a place to ask questions about homework and helped her plan her future. For sixth grader Javier Vizcardo, DreamCatchers helped him realize his passions for coding. He looks forward to high school and a future as a software engineer. For the other 57 students currently enrolled in DreamCatchers, the program represents the first rung on their climb to achieving their aspirations, with college seeming as a realistic step in the process. 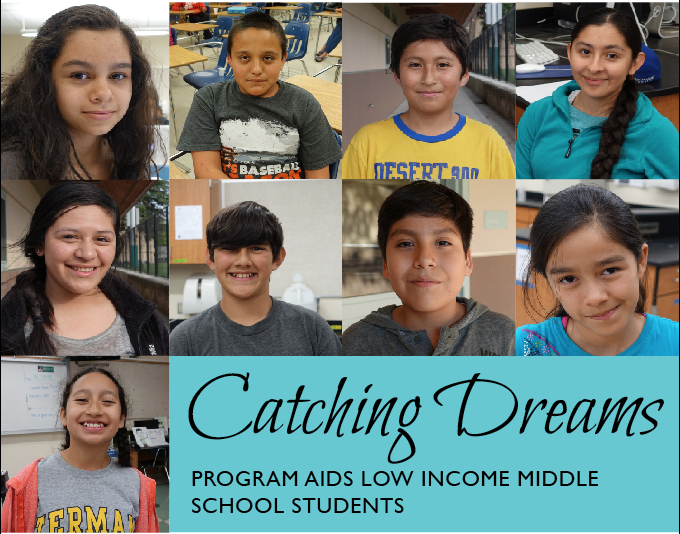 For them, DreamCatchers isn’t just extra school; it is a way to truly grab ahold of their dreams. Seven years ago, Sarah Mummah, then a sophomore at Stanford University, founded DreamCatchers with a mission: to engage the next generation of leaders in helping underprivileged middle school students thrive academically, socially and physically. Now, the organization has expanded to include 60 students and 60 volunteers, a full-time board and staff members, and full access to classrooms and materials at Paly. But it has been a long journey for the program to get to where it is today. Nickerson, DreamCatchers’ first full-time Program Director, originally volunteered with DreamCatchers as a classroom director during her senior year at Stanford. Students come to DreamCatchers twice a week for two-hour sessions, which are comprised of a short lesson followed by homework time. The lessons are grouped together in different units such as mathematical skills, cooking and nutrition, and journalism. “We’ve done some academic [units], some life [and] future planning, thinking about your future horizons, and then some study skills, social-emotional [lessons],” says Barbara Klausner, executive director of DreamCatchers. To balance academics with future-planning, the leadership team designed lessons to get students thinking about potential jobs. Once students chose a career, they built up monthly budgets and calculated expenses for their future. Careers ranged from becoming YouTubers to doctors to computer scientists, but all students began to set goals for their futures. While lessons are a large part of DreamCatchers, the majority of the time is spent on homework, with tutors coming once a week. The other session of the week is devoted to independent homework time to help the students develop study habits. The tutoring program has been helpful for many DreamCatchers students, who often come from exclusively Spanish-speaking households, lacking the ability to consult their parents about their homework. “I could ask [my tutor] questions on my homework because my parents don’t speak English, so it was hard for me to translate [my homework],” Giselle says. Javier was also able to get help in English. Before coming to DreamCatchers, Javier ruefully notes that he was unable to spell. To provide individualized tutoring, the program opened up tutoring opportunities to local high school students this year. The tutors include Paly freshman Frances Zhuang, who enjoys the experience and plans to continue mentoring her student. DreamCatchers students listen to a lesson on nutrition and healthy eating. DreamCatchers has expanded significantly this year, and the board hopes to refine the quality of the support offered and eventually extend the opportunity to more students. “I’d say our immediate priority is building a program that will really be customized for each student, … so that whatever tutoring we do, whatever lessons we provide really make the most sense for what [a] kid needs,” Klausner says. DreamCatchers hopes to expand to 90 students within the next few years. But first, the organization must recruit more volunteers so that they can continue to provide the benefits of one-on-one tutoring.